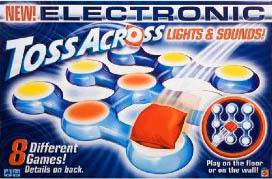 Electronic Toss Across Game is a fun party game inspired by the classic game of Tic-Tac-Toe. The twist with this new electronic version is that the X's and O's switch back and forth with lights and sounds. Includes eight games designed for one to three players including matching games, darts, and the ability to play on either the floor or the wall. This flexibility, combined with the interaction of the participants, makes it a fun game for kids used to sports like interactions.